Zante has a great selection of cultural, historical and natural attractions which all show different aspects to the island's unique character. Keri Lighthouse Watching the sunset at Keri Lighthouse is a must – the views are just stunning. It’s a beautiful spot, so peaceful that you can hear a pin drop and is definitely one for the romantics! Olive Press Museum Discover the history of olive oil at the Aristeon Ecological Olive Press Museum, in Lithakia. As you tour through the factory, you will learn about the manufacturing process as well as having the opportunity to sample the delicious olives, oils and products. The Byzantine Museum This striking building is located in the famous Solomos Square, Zante Town. The small art museum showcases post-Byzantine art as murals salvaged from churches destroyed in the 1953 earthquake. Luna Fun Park Located along the main street of Tsilivi, this is a great little spot for keeping younger people entertained. Activities include trampolining, inflatables and face painting, as well as a games arcade. Plus, drinks are served in the garden area so you can relax while keeping an eye on the fun. Most of the activities are outdoors, so it’s a great place to visit early evening. Cameo Island This beautiful island is located just off the coast of Agios Sostis and is only accessible via a footbridge. There’s a small beach where you can relax to chill-out music, by day, and a beach club that comes to life, at night. Agios Dionysos Church This impressive Greek Orthodox Church sits in the heart Zante Town, along the waterfront. Home to the relics of Patron Saint of Zante, an annual festival takes place on 24thAugust, on which the whole island comes together to celebrate his life. Tsilivi Located on the North East Coast of the island, 5 miles from Zante Town, Tsilivi has expanded over recent years to become a popular family resort. There’s plenty going on with a great choice of shops, bars and restaurants, a beautiful sandy beach as well as its very own waterpark and mini golf course. And whilst it’s grown in size, it still retains its Greek charm and is a great choice for an enjoyable family holiday. Agios Sostis If you’re looking for a taste of real Greece, Agios Sostis is a great choice. There’s a small sandy beach with traditional tavernas lining the waterfront and views across the crystal clear waters to Turtle Island – stunning! 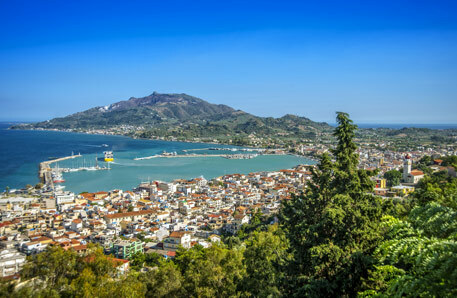 This quaint resort is perfect for a relaxing holiday with livelier options within a short drive, including Zante Town. Laganas Laganas is well-known for its lively nightlife scene, with many bars and clubs along its Strip leading up to the beautiful long sandy beach. The side streets have several more laid-back chill out bars and there's a great mini golf course for kids. Kalamaki Kalamaki resort is known for its beautiful large sandy bay, one of the nesting places for the endangered Loggerhead Turtles. Although it's almost an extension of neighbouring Laganas, the atmosphere is much more relaxed and laid-back. The area has mini golf facilities, a go-kart track, horse riding and a fantastic play park for children. Zante Town The vibrant capital town of Zante has a strong Venetian influence that comes to life at night. Combining interesting history, culture, shopping and dining, it’s definitely worth visiting. By day, wander the cobbled streets up to the Venetian castle or enjoy a Greek Meze along the waterfront. And by night, venture to one of the many bars and restaurants within the town or head to Bochali Hill and enjoy a drink overlooking the twinkling lights of the town, below.